The deepening presence of artificial intelligence in the workplace — and its looming impact on societies around the world — is forcing government and industry leaders to grapple with new and difficult questions about a technology-driven future that’s arriving faster than many are prepared for. That’s particularly apparent to Sreeram Visvanathan, who, as global managing director for all of IBM’s government business in more than 160 countries, now sees AI dominating discussions among the world’s public sector CIOs. Visvanathan sees all sides of government: from defense and intelligence to public safety and policing, judiciary and social services, and the CIOs responsible for national infrastructures, smarter cities and education. While his background is in technology and engineering, his passion since joining IBM 16 years ago, he says, has been challenging the status quo and leveraging innovation and modern technologies to fundamentally transform industries. 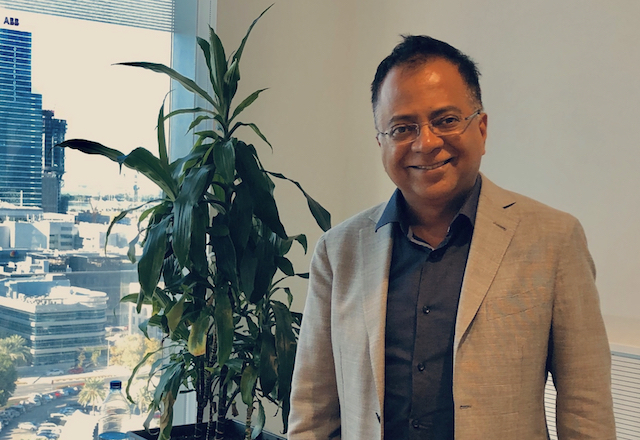 FedScoop met with Visvanathan in his offices in Dubai in late December to discuss how he sees AI unfolding in governments across the globe — and why he believes government CIOs are uniquely positioned to drive the AI debate within their organizations. Editor’s note: The transcript has been edited for clarity and length. FedScoop: You’ve commented that a lot of government leaders you meet around the world aren’t prepared for how quickly AI is coming and that many may not be asking the right questions. What are you observing? And how might government leaders get better prepared? Sreeram Visvanathan: If I look at the last 12 months, the dialogue and debate are no longer if, it’s when, and that’s changed around the world. I notice it in any discussion I have. But many people are still cautious: experimenting, doing proof concepts, maybe playing around with some chatbots, or automation around a stand-alone part of a process rather than an end-to-end process. If you look at other industries, they are looking at AI and saying, “How can I reimagine the entire process?” That’s because you have a profit and loss account that you’re trying to manage and…you’ve got competition from everywhere. In the government sector, people are still debating should we, should we not? Do we need to cleanse the data first? What is the single version of the truth that I can have before I can teach a machine how to understand the data? The thinking is sequential at the moment. Once the first movers start making some leaps, though, and the benefits become obvious, then others are going to take leaps. We see several forcing functions around the world that are going to make this not an option anymore. The first is an aging workforce. If you look at the government workforce in many of the countries, especially in Europe, it’s aging rapidly with, in the next five years, 20-to-30 percent retiring. Take Germany, I think it’s closer to 40 percent. Imagine the impact, the loss of policy-making capabilities, the loss of customer service and citizen service that you lose. How do you replace that? I think we as an industry can start addressing some of those workflows…by sharing examples. Intelligence and public safety are wonderful areas [using] AI for video analytics, structured and unstructured data, and patterns, drawing from volumes of data that a human being can never go through and where there’s a compelling need to stop bad things from happening. They’ve embraced it. But in civilian government, it is still slow. Our view is AI is going to take off. The first movers are going to take some risks, but they’re going to see benefits. FS: You’ve said policy makers may not be engaged in the right debate about AI. How might you reframe the discussion? SV: I think that the debate that needs to be had is, “Is AI really going to kill jobs? Or is it going to be more replacement of one set of jobs with another set of jobs?” The jury is out on this. You get two different views. One says, for every job that you lose, you’re going to replace with a new type of job and a new set of skills. So, all we need to do is train people on a new set of skills. The other school of thought says, there’ll be a big part of services-related jobs that a machine can learn. If you look at many of our mature markets, over the last 30 years they’ve gone away from manufacturing and design to becoming much more service oriented. Those are exactly the jobs that can get replaced or significantly reduced by machines. So, what do people do? What do universities need to teach them? How will they work? Then you add another dimension to this: Most of our children and grandchildren will live beyond a hundred. So, they’re going to have multiple careers and need to become lifelong learners. But what are they going to learn that makes them more valuable than a machine? These are existential issues that need healthy debate and we don’t see enough debate anywhere in the world. It is happening in pockets but not at the scale that needs to happen. FS: Which governments do you see emerging as early AI adopters and what are the consequences if you’re a late adopter? SV: I don’t think there’s an easy answer to the consequences, but let me tell you what I’m observing. As I travel around, AI provides a great leap-frogging mechanism. Take Dubai as an example. It has mandated that all agencies use blockchain technology. They are looking at end-to-end processes. No other government around the world has done that. In Abu Dhabi, for instance, they’ve defined some 80-plus customer journeys, for everything a new expatriate needs coming to live in Abu Dhabi. They need a work permit, flights to come into Abu Dhabi, a place to live, a car, schools for their children and so on. All those services are being integrated into one package of services no matter what the backing agency is. Now, that’s a very interesting way of looking at [government services] because you’re breaking through the cycles of “this is my turf, this is my data, this is my customer.” Our view is governments are going to compete for resources more and more. You see it now the way Amazon reversed [its search for new headquarters cities], asking, “Who wants my business?” That’s going to happen between countries and between states in countries. Does that mean that Dubai or Abu Dhabi is going to compete with the U.S.? Of course not. But they’re going to be more competitive than neighboring countries to attract investment. In the U.S., you have states that are moving faster than others. Take Delaware. We just did a blockchain piece of work that allows you to get a business license much faster. Ease of doing business is going to be one of the advantages. The point I’m trying to make is, smarter markets or states that put some distance between them and others in terms of breaking down the silos between agencies are going to get a distinct advantage. The European Union Council discussion around the role of AI is very interesting because they have a critical mass in terms of countries, in terms of workforce, in terms of governance. It’s the most robust thinking that we have seen. The issue that I have with this is that, it [offers more as] a leadership paper but not practical implementation for day-to-day operations. For me, the debate needs to be led by CIOs with the CEOs of agencies to say, what is the implication, what could be the benefits and how can we serve our constituents better through the use of AI? FS: How would you suggest CIOs advance the discussion? SV: I think the CIOs [need to go] on the offensive and say, “Here is the potential of AI. If I understand the business of our agency, what data we have, what data we could use, and here are the implications, the possibilities, and engage in a debate with the business side of the agency,” I think CIOs will, one, get buy-in, but second, get more budget because it will be seen as transformational. The CEO has to buy into it, but it has to be a partnership, and I think the CIOs have a wonderful chance to lead this debate. FS: What other trends are you seeing around the world that U.S. CIOs should keep their eye on? SV: There are a few things that I’m observing: One is a focus on design and experience. A lot of the time we have spent as IT professionals has been on the engineering side of things, not on the experience side of things. The experience side of things is what drives production and endorsement. I’ll give you an example. One of my clients disperses all [of their country’s] social services benefits and retirement pensions, worth billions of [dollars]. The previous mentality was: I’m the provider, you’re the recipient, you need to claim from me. Now they’ve turned that into a design where they’re in the service of the person who needs the service. They have saved literally billions of [dollars] in the way that they’ve orchestrated the consumption of the service…where the validation happens behind the scenes. AI tools, for instance, see as you’re filling in the application if you claim to be living in a separate house, but social media shows that you’re living with your parents. The AI can come back and say, are you sure this is your address because we found this other address? The fraud that happens with social services currently quickly drops. So, it’s design and workflow being thought through both from a customer service angle but also to address your core issues, which is what the CIOs need to do. A second thing is talent and employee experience. We all know it’s a brutal war for talent and it’s going to get worse, especially talent that understands AI and cloud. And in the AI industry, you can’t exactly outsource everything to a third country, so you’ve got to build talent locally. Yes, people who have this notion of service to their country are going to come and join you, but you still have to create a work environment and learning environment that is conducive to attracting talent. I see the best CIOs thinking about employee experience, not just about their depth of technology. How do you create the right workspace, the right collaboration alignment? I see CIOs rotating people in and out of laboratories that they create, where new tech is tested. That gets a lot of people energized and excited. Some of the best CIOs actually take some of the older members of their team who are not up to date with the latest technology, mix them up with young upcoming tech geeks, put them into a lab and then take them back into their day-to-day business and suddenly you start seeing a pattern change in how they think and implement solutions and engage in business. Lastly, I’ve seen the best CIOs try and frame the “exam question” differently — they spend a lot more effort not on the downstream government work but on the upstream arguments about what the problem is they’re trying to fix. And that changes the downstream outcomes. So those are the things I would say to CIOs.